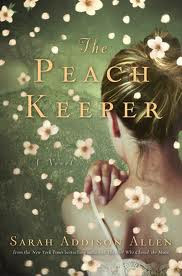 The Peach Keeper was written by Sarah Addison Allen. Walls of Water, North Carolina, where the secrets are thicker than the fog from the town’s famous waterfalls, and the stuff of superstition is just as real as you want it to be. Sarah Addison Allen has succeeded again in making a book a little magical and unreal seem very real and possible. She is definitely one of my a favorite authors. I also always find her book site to have some special features (um... recipes for things that sound delicious!). What is "walking pneumonia" anyway?